But just as Wynne thinks all her dreams are coming true, her ex-boyfriend walks back into her life at the worst possible time. Steve broke her heart years ago, and she's still sorting through her feelings for him. Her heart isn't as clear as her head that it's past time to move on--even though she's engaged to Andy. At a local TV talk show appearance, Wynne meets Meredith, who won another reality TV show--Marathon Mom--proving herself nothing short of a superhero. As Wynne's beach wedding plans spin out of control, Meredith offers to help, unknowingly stepping on Wynne's secret feelings...and exposing some secrets Meredith has been keeping to herself. Can these two reality stars get real about their feelings? Will Wynne go through with her televised wedding and be the perfect June bride the network is looking for? 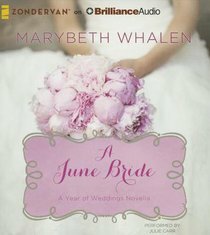 About "A June Bride (Unabridged, 2 CDS) (#07 in A Year Of Weddings Novella Series Audio)"